The Reef Octopus Protein Skimmer Delay Timer will give you peace of mind when the power goes out. In the event of a power outage most sumps will fill with water from the display and plumbing producing a higher than normal water level within the sump. This timer is designed to keep the protein skimmers from overflowing into the sump and making a mess due to the excessive water after a power outage. The Reef Octopus Octo Protein Skimmer Stand 1 (ROP-SST1) makes it easy to raise protein skimmers to ideal water levels. Provides an extremely solid platform for the skimmer to rest on. Adjust to 3 heights. The Reef Octopus Octo Protein Skimmer Stand 2 (ROP-SST2) makes it easy to raise protein skimmers to ideal water levels. Provides an extremely solid platform for the skimmer to rest on. Adjust to 3 heights. 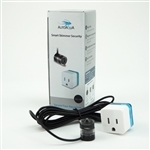 The AutoAqua Smart Skimmer Security uses the uniquely-designed contactless optical sensor to prevent the protein skimmer from overflowing. No moving parts to service or fail making this unit incredibly reliable. A magnetically coupled sensor makes it super easy to install and adjust the desired level in the collection cup. The Reef Octopus Octo Protein Skimmer Stand 3 (ROP-SST3) makes it easy to raise protein skimmers to ideal water levels. Provides an extremely solid platform for the skimmer to rest on. Adjust to 3 heights. With the OCTO WC100 4" Waste Collector you can put an end to smelly collections of skimmate while providing a safety net in the chance that your skimmer may overflow. Just plug your skimmer pump into the included Reef Octopus Protein Skimmer Delay Timer. Requires 15/32" tubing. Height: 18". Reef Octopus OCTO Protein Skimmer Cleaner-200 Neck Cleaner is designed to wipe the neck clean of compatible Reef Octopus protein skimmers. Preventing buildup within the skimmer neck will greatly increase efficiency. Note: Requires controller or timer to operate as constant use is not necessary. Compatible protein skimmers: Classic 202-S, Classic 200-INT, Classic 200-EXT, SRO 3000INT, SRO 3000EXT, Regal 200-S, Regal 200-INT, Real 200-E.
With the OCTO WC140 6" Waste Collector you can put an end to smelly collections of skimmate while providing a safety net in the chance that your skimmer may overflow. Just plug your skimmer pump into the included Reef Octopus Protein Skimmer Delay Timer. Requires 15/32" tubing. Height: 21.75".